I can't mention it enough, but Xu-Fu's has the best strategies so far. Couldn't agree more. But I have run across a few that just don't work and it is still missing a strat for a few fights. Need a strategy for Kwint/Elemental..
FuxieDK wrote: Need a strategy for Kwint/Elemental.. I'm having trouble thinking up something that MIGHT work, nevermind something that actually will. I guess you need a lot of stuns/swaps reset the deep bite counter but it's still pretty fubar. So they're basically like any strategy for Kwint? Nah.. 8 of them are pretty straight forward.. Only Aqua was somewhat RNG too, but not too bad.. If anyone finds a truly generic Kwint/Elemental strategy that works, please shout!! I have an ugly hole in my FFH-addon.. It's the only fight I cannot do. Pikafido wrote: I can't mention it enough, but Xu-Fu's has the best strategies so far. Have to admit that I was impressed when I did my first 3 rounds of the Celestial Tournament to get Xu-Fu (now, what the heck? Which battles am I gonna use him? ), and the fights were flawless ... and the procedure is detailed and IMPORTANT. I think I only had one buggaboo, and it didn't matter as the other pet could finish it off, but all in all, it was fairly well written and clear as a bell! I've done it today with the latest add to Xu-fu's guide. took me some tries but i got after about 5-6 times. Please consider donating to Xu Fu's site. A dollar or five <g> would go a long way. I have no connection with the owner but have used the site daily for years. It is a blessing for pet collectors. Just think about it. 19 bandages AND 3 "normal" heals, and I finally got it.. It's way too much RNG for my taste.. I used the first two pets and substituted the Ruby Droplet 112 for the Blazehound. Kept failing with the hound but I got it first try with the Ruby Droplet. Could heal myself with drain blood, hide from his maw’s big attack, and acid touch helped heal, too. Finished with 3 hp but it worked for me. Pray to the RNG god. This was my 97th attempt at the Kwint Elemental fight. Weird ... Wowhead is full of ideas and combinations, none of which I have been able to use and make work ... most of them have really poor and bad procedures, with a couple of them wasting a big hit, on a dive, or invis, instead of using something else when that happens. My thoughts are that too many of those folks posting are just plain theory crafters, and they are not that good Pet Battlers, or they would not be posting that stuff. But there is one towards the bottom that should have been given a lift, but ... who the heck reads anything these days? And have to read to the bottom of the page to find it? .... get lost!!!! Again, the most important part of it all, is the procedure, and if you know your pets, you will know how to adjust and use that strategy easily enough. You won't need the lucky charms for breakfast, or a pat on the head, or some bacon and eggs off Rag's head in the morning ... you just need to read a little more than the first 3 lines! Yeah the problem with wowhead is too much messy information, navigation, missing information, bits and pieces. Its not a good format for consolidated, structured strategies. I've been using Xu-Fu as well since Legion. It's on point, easy navigation and overview, user-based upload/input, alternative strategies, detailed walkthrough of the fight and comment section as well if everything else fails. It is pretty good source for information/strategies, also with strings (not that I use it). I recently started the achs myself and didn't think further about it, but the single-pet tamers aren't eligible as tamers. That leaves 19 available and you need 15. From a random wowhead comment I gathered that Leana in SSV, Kwint in Tiragarde and Fizzie in Drustvar should be annoying/RNG/hard so those should be avoided if you don't want to waste time. If there is more or worse I don't know, but you got choice, is my point. Don't do what I did and just started in one zone and going through each tamer systematically, I ended up at Kwint before knowing this fact as my 3rd tamer. Safe to say I spend hours instead of 30min per tamer on him. The man surely loves his sharks. Skip the hard ones, find 15 you want to do and go from tamer to tamer running the 10 families through each. Also remember the pets must be level 25 and same family, just for those easy strategies where one pet can solo and you gotta random-fill slot2 and slot3. That leaves 19 available and you need 15. From a random wowhead comment I gathered that Leana in SSV, Kwint in Tiragarde and Fizzie in Drustvar should be annoying/RNG/hard so those should be avoided if you don't want to waste time. If there is more or worse I don't know, but you got choice, is my point. Also remember the pets must be level 25 and same family, just for those easy strategies where one pet can solo and you gotta random-fill slot2 and slot3. Really good advice. I also would recommend skipping the 3 trainers you named (and you can skip 1 more on top of that, so if you're struggling with a family on a particular trainer, just skip it and make it up elsewhere). I ended up skipping the Crab People one in Drustvar, not that it's hard but I completely forgot it was there. And YES, all the pets in the team have to be level 25... I tried to get clever and carry pets and then realized I wasn't getting credit (thankfully I checked each achieve before I left the tamer). ... That leaves 19 available and you need 15. From a random wowhead comment I gathered that Leana in SSV, Kwint in Tiragarde and Fizzie in Drustvar should be annoying/RNG/hard so those should be avoided if you don't want to waste time. 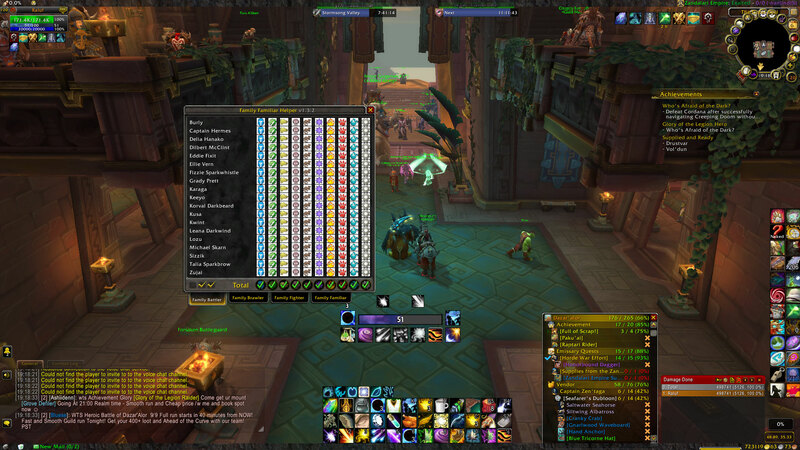 Got 64 (or 72 can't remember) PC's off Leana Darkwind. Again, you have to study things a bit so you know how to come back to it. The Jelly is good, and so is Wolpertinger, and I only got to my Dragonkin once when the turkey only had 200 hit points. Kwint is not hard. Darkmoon Central and Ikky. But paying attention to the shark casts is a must, since one of them adjusts to your first cast. Fizzie is a piece of cake, though it can be ... strange if there are too many crits going against you. Fish Slap is your friend and then a Rapana Whelk to finish it off in slow motion! NONE of the fights are so hard that it can't be done. The main issue is people posting some really bad crap on Wowhead and other places, with theory-crafting ideas, instead of actually doing the fight. Good example ... Korval ... so you bring up your Nexus BigHit and you hit 3 ... and he just hits you. Then you hit 1. He just hits you. Then you hit 2, and he immediately goes up to cancel out your first hit of 3. Same thing if right at the start you hit 2 ... boom, he goes up! The hard part is learning NOT TO WASTE your big hit/s on all of these fights. The fight I like the most? The one everyone hated a few years back ... the fatso in Nagrand ... it was easy ... you just have to pay attention and make sure you get 3 Bonestorms in ... and the fight is just about over ... that means all 3 pets that have Bonestorm, which is easier than trying to get the other pet back in to do it again. I remember 100 strategies from Unborn Val'kyr to Unborn Sun'shine ... but once you know the rotations for these fights, you know that you should not plunk the big hit so it goes off at the same time that the fudger puts up the shield ... cast wasted and fight in trouble! Main reason not to use that, btw, since you have to think ahead and time it. Ok seriously - this is for FAMILY BATTLER achievement. Not for WQs for charms. How is using a jelly, Wolpertinger and dragon team relevant to this achievement? None of what you posted above are actual strategies for getting Family Battler done but you're claiming they're all easy. Kwint is literally impossible with certain families. If I'm misunderstanding and you had no problem using your own theory crafted strategies, why not post your exact team with breeds and movesets and help us all out? Not impossible, but very very RNG based, for especially Elemental..